The Morgantina Hoard has gone on display in the Palazzo Massimo, Museo Nazionale Romano, Rome (until 23 May 2010) [MiBAC press release]. The hoard is part of a series of returns of antiquities from North American institutions. Some $22 million worth of objects linked to Morgantina on Sicily have been handed back. 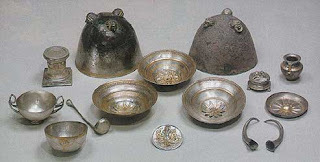 Malcolm Bell has talked about his work at Morgantina (Elizabeth Wilkerson, "Underground tale told: Malcolm Bell and the case of the missing silver", University of Virginia Magazine December 12, 2001). In 1996 the Italian government asked Bell to excavate the hill where he’d seen the clandestine work. When Bell and his crew reached the floors, they found two large holes that correspond to the size of the lots bought by the Met. They also found a 1978 Italian coin that helped pinpoint the time of the looting. When, after several requests, Bell was allowed to examine the silver at the Met in 1999, he puzzled over a lightly scratched inscription on the bottom of two of the pieces. Translated by the museum curator as “from the war,” the words suggested that the silver had been buried as the city was being captured. Instead of “from the war,” Bell realized, the word was the possessive form of the name Eupolemus. The name represented the owner’s claim to the silver. “We don’t have too many names from ancient Morgantina, but we do have the name Eupolemus,” Bell said. A lead tablet in the Morgantina museum bears the name — and the tablet is the deed to a house in the area where Bell had found the looters’ tracks. “It was almost like meeting the man. It was one of those moments of epiphany when you realize something makes far more sense than you had thought,” said Bell. Details of the find can be found in Franco De Angelis' summary (p. 177). The location for the burial appears to have been in a Greek house in the western part of the city. A full discussion can be found in Guzzo. The hoard will go on display at the Museo Archeologico Regionale Antonino Salinas di Palermo from June 2010. Bell, M. 1997 . "La provenienza ritrovata: cercamdo il contesto di antichità trafugate." In Antichita senza provenienza II: Atti del colloquio internazionale [Viterbo] 1997, edited by P. Pelagatti and P. G. Guzzo: 31-41. Bollettino d'arte suppl. to nos. 101-2. Rome.